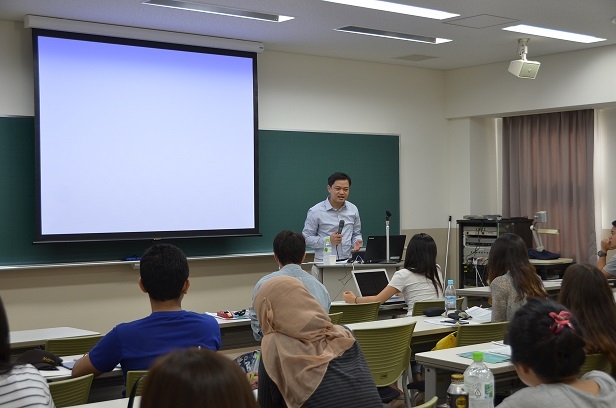 Mr. Vathouniyom Douangmala, Director of the Tourism and Exchange Division of the AJC gave a lecture at the Kwansei Gakuin University on August 4, 2016 in response to a request by the University. The lecture was conducted as part of the University’s ASEAN Project Summer Intensive Seminars, which is a series of seminars in English to learn about the ASEAN-Japan Relations, the politics, the economy as well as the society of dynamically growing ASEAN region. The University launched the project in 2013, and it was the second time for the Centre to participate in the project. Mr. Vathouniyom’s lecture was conducted as part of the introductory session on the ASEAN. In the lecture titled “ASEAN-Japan relations in the era of ASEAN integration”, he elaborated on the history of the ASEAN-Japan relations, followed by introduction of the missions of the AJC. He also shared his insights on how to promote tourism and exchanges of persons between the ASEAN Member States and Japan, and attractions of Laos, his home country, with the students. The lecture was well-received by 44 students, including 11 students from the ASEAN Member States, who participated in the project.